This is a two day advanced course focusing on identification and management of the barriers to achieving good outcomes in the under 55 year old population. In the United States, the incidence of stroke in individuals under the age of 55 continues to increase and billable length-of-stay continues to decrease across the continuum for stroke survivors. This course will help therapists identify the key issues that need to be treated in order to facilitate the “younger” stroke survivor back to active participation in their community. This course will provide review of basic but critical issues in the stroke population such as area of the brain involved and the cognitive, visual, language, and behavioral sequelae. There will be identification and management of comorbitities. The importance of a transdisciplinary team approach across the continuum will be discussed throughout the course. This class provides clinicians with the information they need to know about motor learning, managing fatigue, treatment of the hemiplegic shoulder, and management of hypertonicity to achieve improved outcomes. These are frequently the most complicated issues in stroke rehab and are the most frequent barriers to the stroke survivors progress in therapy and participation in their community. Laura’s sixteen years of experience in the post acute setting provides a clinical perspective on how to treat/manage these issues for the best outcomes. There will be lab sessions for the hemiplegic shoulder, movement analysis, and gait, as well as case studies on neuroanatomy, comorbities, and home program development. There will be review of the current evidence based practice, and how to incorporate this evidence into the best treatment strategies for improving the community participation of the stroke survivor. This course puts together a template for problem solving the more complex young stroke population and the issues they face in order to integrate back into their community. Identify neuroanatomical lesions and subsequent deficits. Identify cognitive, behavioral, vision, and language deficits post stroke. Develop strategies for assessing and treating cognitive, behavioral, vision, and language deficits for improved outcomes throughout the continuum. Identify the impact of comorbidities on outcome and therapy planning. Define a transdisciplinary approach and describe ways to develop this in your treatment setting. Define motor learning and identify how to achieve better outcomes by using a motor learning approach. Define spasticity, dystonia, and spastic dystonia, and identify the best medical and therapy interventions for management. Identify key movements to analyze, interpretation of the movement observed, and how to set up treatment strategies for improved outcomes. Identify causes of fatigue in the stroke population and treatment strategies to diminish the impact of fatigue on function. Identify the pain generators that contribute to hemiplegic shoulder pain, and perform basic treatment techniques for management. Discuss the most current evidence based information on upper and lower extremity orthotics for the stroke population. Identify keys to achieving community ambulator status and community integration. Develop home programs for continued progress not just maintenance. I love the challenge of brain injury. 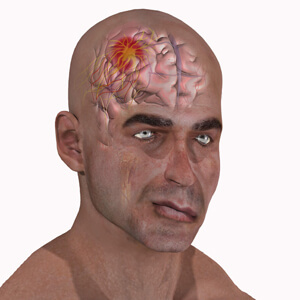 While there may be general patterns in brain injury, no two are exactly alike. Let me show you how to deliver better results for your younger (under 55 yrs) stroke patients.